Dolphins are like children. Big, slippery children. They are playful, curious and immensely lovable. Also like children, taking care of them is a huge responsibility. The Texas State Aquarium is home to four: Liko, Schooner, Kai and Shadow. I went behind the scenes to meet the dolphins and their two trainers, Emma Gilbert and Sarah “Ziggy” Zigmond. A day in the life of a dolphin trainer is exciting, rewarding and long. The trainers are with the dolphins at least 12 hours a day. They are on call 24 hours, ready to respond to any emergency. The Texas State Aquarium is accredited by the Association of Zoos and Aquariums (AZA). This means the aquarium abides by the highest possible regulations for animal management and care. The AZA keeps strict standards for facilities and daily routines. The aquarium strives to go above and beyond the base guidelines. For example, the Dolphin Bay exhibit holds 45,000 square feet of water, nearly double the AZA’s space requirement. Everything behind the scenes is scrupulously clean. Anything that goes into the water with the dolphins, such as toys or wetsuits, follows a strict disinfection protocol. The kitchen is impeccably organized. All the meals are prepared in advance with fish fit for a five-star restaurant. Each dolphin eats up to 25 pounds of fish per day — that’s 5 percent of each animal’s body weight. The trainers switch up feeding schedules daily so the dolphins never know what to expect. Some days, they’ll eat 12 times; some days, eight. And all the meals are at different times. The lack of a schedule mimics the eating habits of dolphins in the wild. It cues their natural instincts since animals in the wild don’t have three set meals a day. The four dolphins have a favorite snack, too. Besides all the fish, they get treats during shows and training exercises: colorless and flavorless Jell-O, cut into perfect cubes. The bond between the dolphins and their trainers is strong. Gilbert talks about the dolphins as if they are her children, expressing pride for their accomplishments. The fun tricks that visitors see during the dolphin shows are only secondary to their training. “The main focus is that they voluntarily participate in their health care,” Gilbert said. The trainers ask the dolphins to showcase their husbandry behavior. Actions like opening their mouths for dental checkups or presenting their flukes and tails are to assist in their medical needs. The newest — and youngest — dolphins in the bachelor pod are Liko and Schooner. They came from SeaWorld Orlando at the start of 2016. 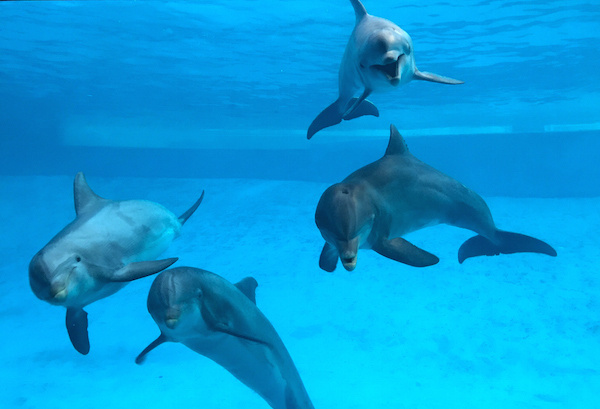 At first, the aquarium kept the newcomers separate from the veteran dolphins, Shadow and Kai, while they got used to their new home and trainers. The pairs were kept in separate enclosures, divided by a wall where they could see and hear each other, but not swim together. They had conversations, too. During that time, staff could hear their vocalizations outside and underwater. The dolphins were curious about their new neighbors. The pairs are together now, playful as ever, with complete control over where they go and with plenty of toys. The toys are creatively structured, meant to help them learn and use tools in terms of their natural behaviors. The toys are one of many forms of “enrichment,” a process that creates a dynamic and fun environment for the animals. The trainers design a life of variety for their charges. They frequently change the exhibit. (When I was there, they created a miniature waterfall using a waterhose.) They also play them music, display movies and TV shows, give them mirrors so they can look at themselves, and play “peek-a-boo” with a sheet of construction paper. Sometimes, they even bring a piano into the underwater viewing room for entertainment. On their birthdays, the dolphins get special — and elaborate — cakes made out of frozen shrimp and Jell-O. Gilbert has been working at the Texas State Aquarium since Dolphin Bay opened in 2003. She might be one of the most enthusiastic and friendly people I have ever met. A personality like hers is a requirement for trainers. (Dolphins are intuitive and they pick up negative attitudes.) Dolphins choose to interact with trainers, so their personalities have to mesh. Besides personality, the Texas State Aquarium has other requirements for potential trainers. They need to be strong swimmers with scuba certifications. A four-year degree in psychology and biology is preferable. Psychology is especially important, Gilbert noted. Dolphins have incredible brainpower, able to process information 10 times faster than people. Trainers must have a deep understanding of the mind to work with such intelligent creatures. The Texas State Aquarium is located at 2710 N Shoreline Blvd. in Corpus Christi. Visit texasstateaquarium.org or call (361) 881-1200 for more information.